You are currently browsing the tag archive for the ‘Mickey’s birthday’ tag. Mickey visits Minnie who has organized a surprise party for his birthday. Mickey gets a piano for a present and he and Minnie perform a duet on two pianos, singing the 1928 hit ‘I Can’t Give You Anything But Love, Baby’, popularized by e.g. Annette Hanshaw and Louis Armstrong. When Mickey and Minnie dance themselves to the 1917 classic Darktown Strutters’ Ball, their music-stools take over their playing (as did Mickey’s stool in ‘Mickey’s Follies’ from 1929). The cartoon ends with Mickey playing variations on the 12th Street Rag on a stubborn marimba. 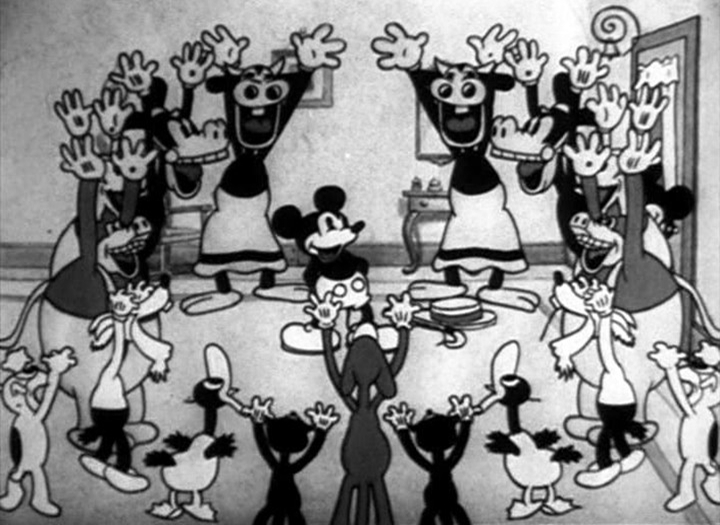 This cartoon is actually one long joyful play-and-dance-routine, but its beginning is quite remarkable: when Mickey and Minnie bashfully ask each other whether they’re fine, this may probably be the first funny dialogue in Disney history. At least, it’s a wonderful example of character animation, elegantly establishing the relationship between the two. Mickey would celebrate his birthday again in ‘Mickey’s Birthday Party’ (1942), which only superficially resembles this earlier short.